The Minot Rural Fire Department will provide superior service to the patrons of the Minot Rural Fire Protection District in an effort to protect their lives, property, and environment. The members of the Department will accomplish the mission through fire suppression, fire prevention, public education, emergency response, and non-emergency response. The Department will maintain the highest level of readiness enabling delivery of fire fighting and emergency rescue services in a safe, competent, and caring manner. MinotRural.Org was designed by Bobby Falcon and Glenn French through volunteer time to give the department its first web page. This site was designed with Microsoft Frontpage and is operated on a dedicated server located on the Minot Rural Fire Department network. This site was created to provide information to the public as well as a place for our firefighters and other firefighters around the region to obtain news and information. The Minot Rural Fire Department is a volunteer organization governed by the Minot Rural Fire Protection District Board of Directors. The Fire Department has a paid Fire Chief and a volunteer membership of 40 firefighters and 3 dispatchers. The Fire Department has its own executive board comprised of active member firefighters. There are committees that work on projects within the fire dept that report to the fire dept. board at regular monthly meetings. We utilize a two way VHF radio and paging system through our repeater and tower, and we are initially dispatched by Minot Central Dispatch. 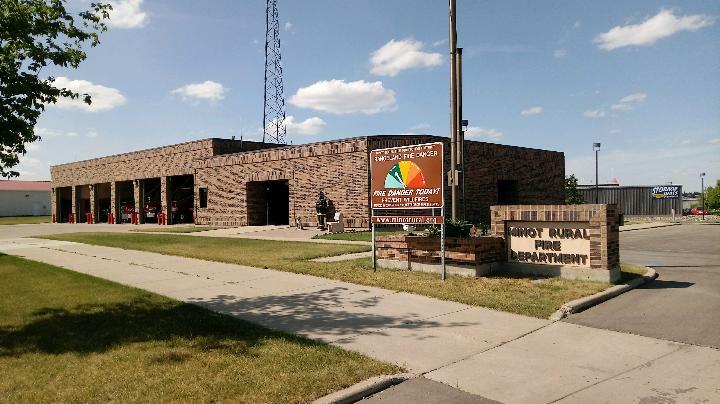 Our dispatchers also respond to calls and relieve Minot Central Dispatch by manning our base station located within the Minot Rural Fire Department. We respond to structure fires, wildland/grass fires, vehicle accidents, hazardous materials incidents and various service calls. The Department holds two monthly trainings on the second and last Wednesday of each month. We also conduct a business meeting every month which is held prior to the last Wednesday training. Please see our Schedule page for a calendar of events planned. The Minot Rural Fire Protection District serves a population of about 5,800 in an area approximately 275 square miles. The District is comprised of residential subdivisions, rural homes and farmsteads and light commercial and industrial developments. US Highways 83 and 2&52 cross through the district. The Burlington Northern/Santa Fe and Canadian Pacific Railroads transport goods through the district. The MRFPD Board of Directors is comprised of elected members representing eight townships. Townships served are: Eureka, McKinley, Harrison, Nedrose, Burt, Afton, Sundre, and Freedom. The Board of Directors meet each month at the Department. They also hold an annual meeting each year in March.